Draft: 2003, New York Yankees, 9th rd. Full name TYLER LEE CLIPPARD…Married, Brittany...One son, Maddox....Graduated from J.W. Mitchell High School in New Port Richey, Fla., in 2003… Earned All-Conference and All-Sun Coast honors as a senior...Committed to the University of South Florida before signing with the Yankees in 2003...Grew up in Palm Harbor, FL. Spent the 2018 season with Toronto, finished tied for 4th in the American League in games pitched (73)...Two-time All-Star enters 2019 sixth among active pitchers in appearances (698)...Owns nine consecutive seasons of at least 67 games pitched, one of just six relievers in MLB history to post as many such campaigns in a career (Mike Stanton/Kent Tekulve lead 10 each) and one of just three (David Weathers 2000-09; Steve Kline 1998-2007) to post them consecutively...His 690 outings since 2009 rank second in MLB behind retired Brad Ziegler (692)...Has never been on MLB Injured List. ..Posted a 1.46 ERA in 13 April outings (2ER/12.1IP) and recorded a 3.15 first-half ERA (48G/16ER/45.2IP) and finished the year with a 2.16 ERA in September (9G/2ER/8.1IP)...Left-handed hitters batted just .210 (25-for-119) with an OPS of just .597 as batters hit just .152 (16-for-105) with runners on and .164 (10-for-61) with RISP...Has held MLB hitters to a career average of .199 and left-handed hitters own a career .192 mark (257-for-1340)...His 11.1 SO per 9.0IP in 2018 was the highest total of his career, just ahead of 2010's 11.07 (his career mark is 10.0 SO/9IP). Combined with Arizona and the Yankees to go 4-6 with three saves and a 3.57 ERA (63.0IP, 25ER) in 69 relief appearances…opponents batted .231 (54-for-234, 10HR); LH .241 (28-for-116, 6HR), RH .220 (26-for-118, 4HR)…retired 44-of-69 first batters faced (63.8%)…allowed 7-of-18 inherited runners to score (38.9%). In 29 appearances with the Yankees, went 2-3 with two saves and a 2.49 ERA (25.1IP, 20H, 9R/7ER, 11BB, 26K)…allowed just 1ER over his first 19.0IP (21 games) with the Yankees. Was acquired from Arizona in exchange for minor league RHP Vicente Campos on 7/31…was added to the active roster on 8/1. Made his Yankees season debut in 8/1 win at the Mets, tossing a scoreless seventh (1.0IP, 1H, 2K)…was his first game with the Yankees since 6/16/07 vs. the Mets at the original Yankee Stadium, his rookie season…his nine seasons between appearances for the Yankees marked the largest gap by a Yankees pitcher since Al Leiter's franchise-record 16 seasons between appearances in 1989 and 2005. On 8/10 at Boston, tossed 1.0 scoreless inning (3H, 1IBB, 1WP) to earn his first win for the Yankees since 6/5/07 at Chicago-AL. Retired 15 consecutive batters (5.0IP, 4K) over a five-appearance stretch from 8/12-20…marked his fourth career streak of at least five consecutive relief appearances with no base runners allowed…retired 16 straight batters overall, including his first batter faced on 8/24 at Seattle. Threw 34 pitches-his most since 9/6/15 at Miami (41 pitches)-in 8/30 win at Kansas City, allowing 1R/0ER in 1.2IP (2BB, 1K). Tossed a perfect ninth to earn his second save of the season (also 4/19 at San Francisco w/ Arizona) and first career save as a Yankee in 9/7 win vs. Toronto. Suffered his first loss with the Yankees since 2007 on 9/18 at Boston, allowing a seventh-inning solo HR to Hanley Ramirez (1.0IP, 2H). Was 2-3 with one save and a 4.30 ERA (37.2IP, 34H, 18ER, 15BB, 46K) in 40 relief appearances with the Diamondbacks…was signed by Arizona to a two-year contract on 2/8/16. Split the season between the A's and the Mets, going 5-4 with 19 saves and a 2.92 ERA (23 ER in 71.0 IP) in 69 appearances…Had 6 saves of 4+ outs, second most in the Majors (5 with Oakland and 1 with New York)…the Indians' Cody Allen had 7…Held the opposition to a .186 average, the 10th-lowest mark in the Majors (min. 60 innings)…lefties hit .137 (19-for-139) and .133 with runners in scoring position (6-for-45)…Appeared in 37 games with the Athletics, going 1-3 with 17 saves and 2.79 ERA (12 ER in 38.2 IP), before being traded to the Mets on July 27 for RHP Casey Meisner…Had a 0.46 ERA (1 ER in 19.2 IP) in his first 20 games with the Mets from July 28-Sept. 4. Turned in another dominant campaign...allowed just 37 hits in 71.0 innings and paced the NL with 33 holds...ranked among NL relievers in holds (first), batting avgerage against (2nd, .152), wins (tied 6th, 6) and opponents' OPS (7th, .517)...pitched in 70+ games for a 4th consecutive season...posted a 1.67 ERA (7 ER/37.2 IP) against interdivision foes and a 3.24 ERA (12 ER/33.1 IP) against NL East rivals...in 20 appearances working on zero days' rest, registered a 1.86 ERA and a .123 batting average against...when pitching, Washington went 55-17 (.764). Entered '12 pitching the 8th, but by season's end, due injury to roommate Drew Storen, saved 32 games in 37 chances in first exposure to closing role...with 32 saves and 13 holds, became 3rd pitcher to record 30+ saves and 10 or more holds in single year (Ugueth Urbina '03, Kerry Ligtenberg '98)...in intial 6 weeks in closing role, from May 22-July 7, worked 17.1 consecutive scoreless innings and successfully converted 14 straight save situations...by closing out a 2-1 win on Sept. 3 vs. CHI. became the 3rd National to reach the 30-save plateau (Chad Cordero '05/'07 and Storen '11). In first career All-Star campaign, led all MLB relievers and established new franchise mark with 38 holds ... 104 K's ranked 2nd among MLB relievers (Craig Kimbrel, 127) ... led NL relievers with 88.1 innings (3rd in MLB) ... ranked among NL relief leaders in ERA (3rd, 1.83 ERA) and batting average against (5th, .162) ... earned the win in the MLB All-Star Game, tossing 0.1 scoreless inning in the NL's 5-1 victory ... struck out all comers during 6-K, 2.0-perfect inning effort in a 3-2 win, May 6 at FLA ... thus, became just the 5th pitcher in the last 25 seasons to work at least 2.0 innings and strike out every batter faced (Chris Schroder, Sept.17, 2006; Rafael Soriano, July 30, 2003; Scott Williamson, May 27, 1999; Roberto Hernandez, July 25, 1996) ... set Nationals single-season mark with 34th hold, Sept. 14 at NYM. Led the Nationals in wins (11) and fanned 11.1 batters per 9.0 innings in first complete big league campaign...pitched ina career-high 78 contests to rank 9th in MLB, 8th in the NL...tied for 5th in the NL with a team-leading 23 holds...112strikeouts ranked 2nd among MLB relievers to only CHI's Carlos Marmol (138), and 2nd among Nationals to only LivanHernandez (114 in 33 starts)...posted career best efforts in strikeout-to-walk ratio (2.7/1), strikeouts per 9.0 inningsand walks per 9.0 innings (4.1)...led MLB relievers in strikeouts in April (23)...paced MLB with those 11 relief wins (noone else had more than 9)...also led MLB qualified pitchers in percentage of swings that miss at 32.2 percent (MIN'sFrancisco Liriano ranked a distant 2nd at 28.0%)...registered a sub-3.00 ERA when pitching on zero days' rest (2.28,25 games), one day rest (2.81, 28 games) and 2 days' rest (2.70, 11 games)...registered an ultra-stingy .154 (6-for-39) batting average against with RISP and 2 outs...worked scoreless relief in 60 of 78 appearances...set single-seasonrecord for wins at Nationals Park, which opened in 2008, as 9 of 11 W's came in DC...when pitching, Washingtonwent 44-34...April 10 at NYM, secured first hold of the season with 3.0 scoreless innings...7 of 9 outs recorded camevia the strike out to match a Nationals ('05-present) single-game record for relief pitchers...the 7 K's also matched acareer high set previously on July 25, 2009 vs. SDP...by notching the win on May 9 vs. FLA, became just the 7th reliefpitcher to record 6 wins among a club's initial 31 games of a season, the first since Jeff Nelson with the 2000 Yankees. In first season working exclusively as a reliever, was perhaps the Nationals' most pleasant pitching surprise of 2009...summoned from Syracuse on June 24, recorded career high 4 wins and 3 holds, while posting an impressive 2.69 ERAand .172 batting average against in 41 appearances with the Nationals...led Washington relievers with 60.1 inningspitched and 67 strikeouts...averaged 10.0 strikeouts per 9.0 innings pitched (67 K/60.1 IP), and .172 batting averageagainst ranked 3rd among NL pitchers (6th in MLB) among those working 60.0 or more innings...ranked 10th amongNL relievers in ERA...was stingy when facing left-handed batters (.122, 14-for-115)...recorded a 1.95 ERA (7 ER/32.1IP) in 22 contests at Nationals Park. Game-By-Game Highlights: Tallied first career hold in rain-shortened contest, June 30 at FLA...fanned career-high 7 in4.0-inning effort to nab the win, July 25 vs. SDP...picked up 2nd win with 3.0 perfect innings, August 3 at PIT...recorded5 outs to notch 2nd career hold in a 5-4 win at CHI on August 27...thanks to 2.0 scoreless innings, matched career highwith 3rd win on September 29 vs. NYM...2.2 scoreless innings rendered career-high 4th win on October 1 at ATL.In Minor Leagues: Began season with Triple-A Syracuse and went 4-1 with one save and 0.92 ERA in 24 relief appearancesbefore joining the Nationals...struck out 42 and allowed just two home runs in 39.0 IL innings...posted a stingy.150 batting average against, including an .091 mark against left-handers...did not allow an earned run (one unearnedrun) in his final 19.0 innings with Syracuse, a stretch that began May 18 and spanned 14 appearances. In first year with Washington organization, spent majority of season with Columbus of Triple-A International League...made 2 spot starts with Washington, going 1-1 with a 4.35 ERA...was recalled from Columbus on June 9 to fill voiddue to June 4 rainout and subsequent June 5 doubleheader vs. STL...in Nationals debut, June 9 vs. SFG, suffered theloss after allowing 3 runs and 5 hits in 4.1 innings...matched career high with 6 strikeouts...was optioned to Columbusfollowing game...was recalled again on June 13...made his 2nd and final start, June 14 at SEA, tossing 6.0 innings of2-run ball to earn the win...was optioned to Columbus following that start. In minor leagues: Paced Columbus in games started (27), innings (143.0) and strikeouts (125)...ranked among ILleaders in starts (2nd, 27) and strikeouts (7th, 125)...among Washington farmhands, finished 3rd in strikeouts and 4thin ERA...went 4-1 with a 1.91 ERA in 6 starts to garner Columbus Player of the Month honors in May...in 8 startingassignments prior to June 9 promotion to Washington, went 4-1 with a 1.54 ERA (7 ER/41.0 IP)...posted impressive.218 batting average against when facing left-handed batters. Was 3-1 with a 6.33 ERA in 6GS over two stints with the Yankees in 2007 (5/20-6/16; 9/17-9/30)...Opponents batted .271 (29-for-107, 6HR); LH .208 (11-for-53, 2HR), RH .333 (18-for-54, 4HR)...held opponents to 3ER or less in four of his six starts...Had contract purchased from Triple-A Scranton/Wilkes-Barre on 5/20...Made his Major League debut on 5/22 at Shea Stadium, earning the win in a 6-2 Yankees victory (6.0IP, 3H, 1ER, 3BB, 6K, 1HR)...tossed a season-high 6.0IP and struck out a season-best six batters...became the first Yankees pitcher to win his debut at Shea Stadium since Brandon Claussen on 6/28/03...Also recorded a sixth-inning double in his ML debut, becoming the fifth Yankees pitcher since 1961 to hit safely in his first game in the Majors...according to the Elias Sports Bureau, Mel Stottlemyre (8/12/64) and Fritz Peterson (4/15/66) accomplished the feat prior to the advent of the designated hitter, and two others did it in Interleague games: Brandon Claussen (6/28/03 at Shea Stadium) and Brad Halsey (6/19/04 at Dodger Stadium)...Became the seventh different rookie starting pitcher used by the Yankees in the team's first 42 games in 2007 (also Kei Igawa, Darrell Rasner, Chase Wright, Jeff Karstens, Phil Hughes and Matt DeSalvo)...according to the Elias Sports Bureau, the last team to start seven different rookies in the first 42 games of a season was the 1911 Cleveland Indians...Recorded back-to-back wins on 5/30 at Toronto (throwing a season-high 98 pitches) and 6/5 at Chicago (AL), allowing just one run for the second time in his first four starts...In his win on 5/30 at Toronto, Clippard (22 years, 105 days old) faced Toronto RHP Jesse Litsch (22 years, 82 days)...according to the Elias Sports Bureau, it marked the first time a Yankees pitcher as young as Clippard started a game against a younger pitcher since Al Leiter (21 years, 337 days) pitched against Baltimore's Jose Mesa (21 years, 126 days) on 9/25/87...the last Yankee to do it in a game prior to September's expanded rosters was Gil Patterson (21 years old, 227 days) against Toronto's Jerry Garvin (21 years, 181 days) on 4/19/77...Was recalled by the Yankees a second time on 9/17 following the completion of Trenton's Championship season...did not make an appearance...Combined to go 6-5 with a 4.50 ERA in 20GS (96.0IP, 104H, 48ER, 47BB, 83K, 12HR) with Double-A Trenton and Triple-A Scranton/WB in 2007...Began the season with Scranton/WB, going 4-4 with a 4.15 ERA (69.1IP, 82H, 40R, 32ER, 35BB, 55K, 7HR) in 14 starts over two stints...In five starts from 4/27-5/17 with Scranton/WB, went 3-0 with a 1.40 ERA, allowing just 4ER in 25.2IP while striking out 31...tossed 7.0 shutout innings (5H) on 5/2 at Toledo, recording a season-high 11 K...Was optioned to Double-A Trenton on 7/24 and in six regular season starts, went 2-1 with a 5.40 ERA (26.2IP, 22H, 18R, 16ER, 12BB, 28K, 5HR)...in one postseason start, recorded a no-decision in Trenton's 5-3, Game 1 Championship Series victory at Akron on 9/11 (5.0IP, 4H, 2ER, 4BB, 5K)...Appeared in three 2007 Spring Training games for the Yankees, going 0-0 with a 1.35 ERA (6.2IP, 2H, 1ER, 2BB, 4K, 1HR)...Entered the 2007 season ranked by Baseball America as the seventh-best prospect in the Yankees organization...also rated by Baseball America as having the "Best Changeup" in the Yankees system...was originally selected by the Yankees in the ninth round of the 2003 First-Year Player Draft. Led all NYY minor-leaguers with 175 strikeouts while posting a 12-10 record with a 3.35 ERA in 28 starts with Trenton...led the Eastern League in strikeouts and games started (28), ranked 4th in innings (166.1) and 7th in ERA...12 winswere tied for 2nd among NYY farmhands...was named EL Pitcher of the Week on 3 occasions...earned the citations forthe periods ending June 25, July 9 and August 20...recorded back-to-back 11-strikeout efforts on July 4 vs. Harrisburgand July 9 vs. Binghamton...became the first Trenton pitcher in the 13-year history of the franchise to toss a no-hitterin a 9-0 win vs. Harrisburg on August 17...won final 9 decisions, July 4-August 27...the Trenton-franchise record, 8,had been set by Carl Pavano (1996) and former National Tomo Ohka (1999). Spent majority of season with Tampa of the Single-A Florida State League...posted 181 strikeouts at 3 levels in NYY'ssystem to rank 5th in minor league baseball...was 10-9 with a 3.18 ERA...led the FSL with 169 strikeouts...also rankedamong FSL leaders in starts (5th, 25), innings (5th, 147.1) and ERA (7th, 3.18). Made 25 starts for Class-A Battle Creek, posting a 10-10 record with a 3.44 ERA...fanned 8.8 batters per 9.0 inningsand notched an astounding 4.5/1 strikeout-to-walk ratio...145 K's ranked 2nd in NYY's system. In first professional season, finished 3-3 with a 2.89 ERA in 11 games (five starts) for NYY's Gulf Coast League entry...ranked 2nd in the Gulf Coast League in strikeouts per 9.0 innings (12.2), 3rd in strikeouts (56) and 4th in fewest walksper 9.0 innings (1.02). April 18, 2019 Columbus Clippers activated RHP Tyler Clippard from the 7-day injured list. 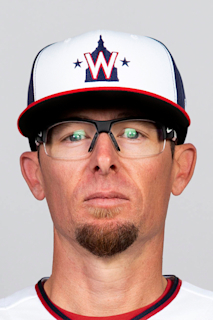 April 3, 2019 RHP Tyler Clippard assigned to Columbus Clippers. March 20, 2019 Cleveland Indians signed free agent RHP Tyler Clippard to a minor league contract and invited him to spring training. March 19, 2019 Cleveland Indians released RHP Tyler Clippard. February 23, 2019 Cleveland Indians signed free agent RHP Tyler Clippard to a minor league contract and invited him to spring training. October 29, 2018 RHP Tyler Clippard elected free agency. March 29, 2018 Toronto Blue Jays selected the contract of RHP Tyler Clippard from Buffalo Bisons. March 7, 2018 Toronto Blue Jays signed free agent RHP Tyler Clippard to a minor league contract and invited him to spring training. March 7, 2018 RHP Tyler Clippard assigned to Buffalo Bisons. November 2, 2017 RHP Tyler Clippard elected free agency. November 2, 2017 Houston Astros activated RHP Tyler Clippard. October 5, 2017 Houston Astros reassigned RHP Tyler Clippard to the minor leagues. August 14, 2017 Houston Astros reassigned RHP Tyler Clippard to the minor leagues. August 13, 2017 Chicago White Sox traded RHP Tyler Clippard to Houston Astros for Player To Be Named Later. July 19, 2017 Chicago White Sox activated RHP Tyler Clippard. August 1, 2016 Tyler Clippard roster status changed by New York Yankees. July 31, 2016 Arizona Diamondbacks traded RHP Tyler Clippard to New York Yankees for RHP Vicente Campos. February 8, 2016 Arizona Diamondbacks signed free agent RHP Tyler Clippard. November 2, 2015 RHP Tyler Clippard elected free agency. July 28, 2015 New York Mets activated RHP Tyler Clippard. July 27, 2015 Oakland Athletics traded RHP Tyler Clippard and cash to New York Mets for RHP Casey Meisner. June 23, 2009 RHP Tyler Clippard assigned to Syracuse Chiefs from Washington Nationals. June 21, 2009 Washington Nationals recalled RHP Tyler Clippard from Syracuse Chiefs.